Two recent publications (DOI: 10.1002/anie.201100274 & DOI: 10.1002/cssc.201300143) demonstrate quite nicely my interest in developing practially usefull ionic liquids for biomass processing. These are focused on the distillable ionic liquid concept where, normally non-volatile, ionic liquids can be distilled at elevated temperatures and reduced pressures as a means of recyling after a number of processing cycles (Fig 1). This is necessary as biomass typically contains short-chain polymers and inorganics that are very difficult to remove from the IL from simple solvent precipitation. Controlling the acidity of the cation was found to be very important for both the distillability of the ionic liquid and also the cellulose-dissolving capatility, in terms of the enthalpy gain upon breakage of H-bonds between cellulose chains (Fig 2). Fig 1. Distillation of [TMGH][Propionate] & X-ray Structure. Fig 2. Cation acidity controlling enthalpy gain upon celulose dissolution. Through strong collaboration with Prof. Herbert Sixtas group at Aalto University, this has translated into new fibre-spinning technology called IONCELL-F. This technology affords very high performance cellulose-based fibres, through direct dissolution in the most suitable distillable ionic liquids (DILs) and air-gap spinning. Work at the University of Helsinki has been the result of collaboration between mainly Prof. Ilkka Kilpeläinen (Laboratory Head), Dr. Alistair King (post-doctoral researcher) and Arno Parviainen (PhD Student). A new recyclable ionic liquid concept was recently published (DOI: 10.1002/cssc.201301261). 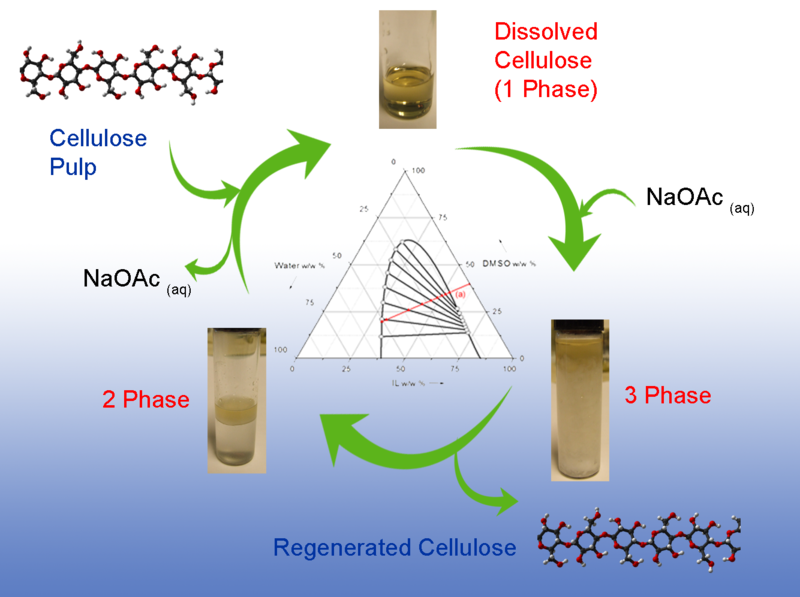 This concerns the development of water immiscible ionic liquids for cellulose dissolution, lignin modification and wood fractionation/pre-treatment. 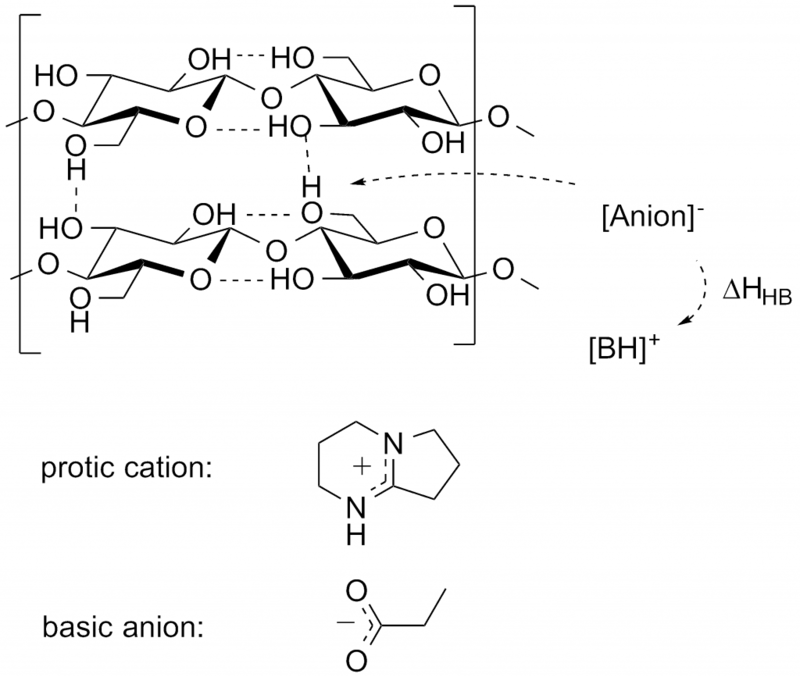 The development has introduced phase-separability as a method of recycling the ionic liquid (Fig 3) by increasing the hydrophobic content of the ionic liquid, by using long-chain phosphonium cations. Cellulose is only soluble using the electrolyte mixtures with dipolar aprotic solvents. However, the use of the more ‘hydrophobic’ cations seems to have a positive effect on dissolution, in terms of the demand for basic species to break H-bonds in cellulose. Fig 3. Phase-separable ionic liquid recyclability concept. Work at the Aalto University laboratory has been the result of collaboration mainly between Prof. Herbert Sixta, Dr. Michael Hummel, Anne Michud (PhD student) and Marjaana Tanttu (MSc student).